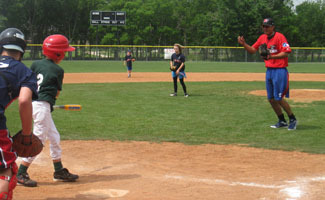 The Heart Walk sponsored by the American Heart Association was held on April 23, 2011, at RedHawks Field at Bricktown. The Heart Walk is held annually for people who have survived heart disease and remember those who passed away. Numerous teams comprised of friends and family affected by heart disease joined together for this cause. The American Heart Association brought together businesses and organizations to promote awareness and a healthy lifestyle. News Channel 5 covered the event as participants walked either one mile or the entire five miles. On Saturday, April 23rd, 2011, Frisco RoughRiders players Davis Stoneburner, Elio Sarmiento, Justin Miller and Guilder Rodriguez visited the Frisco Miracle League fields to play baseball with children who had mental or physical disabilities. The RoughRiders Entertainment Crew, mascots and various staff members joined the fun to entertain the crowd, and players, with various skits during inning breaks. Miss Texas International 2011, Kelli Ansley, also made a special appearance at the event to sign autographs and take pictures with the kids. RoughRiders players pitched to kids, helped refine their fielding skills and signed autographs for everyone after the games. 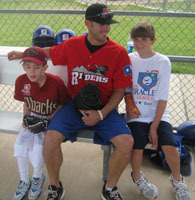 For more information on the RoughRiders Foundation, please visit, www.ridersbaseball.com/foundation. 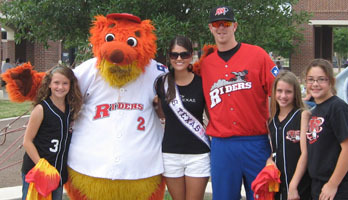 RoughRiders mascot, Deuce, Miss Texas International 2011, Kelli Ansley, and RoughRiders pitcher, Justin Miller. 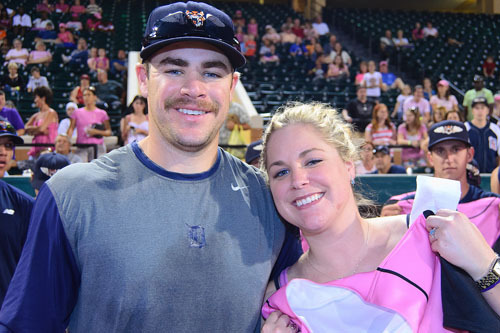 The Lakeland Flying Tigers Pink in the Park Night on April 16 at Joker Marchant Stadium helped the Mary Kay Foundation raise over $6,000 for the 2nd annual event. The Mary Kay Foundation proudly supports research dedicated to finding cures for cancers that affect women and programs committed to ending domestic violence. Flying Tiger players and coaches wore pink jerseys during the game and fans had the opportunity to take the jersey off the back of their favorite player after the game. There was a pre-game cancer survivor parade as well as a pink Cadillac parade on the field. Even the post-game fireworks show had bursts of pink. The event was a great success helping raise awareness and funds for the Mary Kay Foundation. Tony Plagman gives the "shirt off his back" following the game. 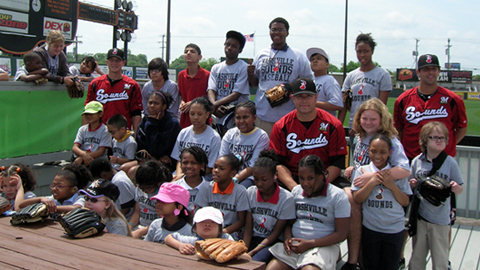 NASHVILLE, Tenn. – Three Nashville Sounds players spent part of their Monday morning at Greer Stadium as instructors for the team’s Annual Fantasy Baseball Camp for the Sylvan Park Elementary, West End Middle IB World Deaf and Hard of Hearing School, and Eakin Elementary, sponsored by Sertoma Club of Nashville. Catcher Patrick Arlis and pitchers Justin James and Chase Wright provided hands-on instruction to a group of 35 children from the three schools. Each of the players hosted stations for the camp attendees that featured pitching, hitting off a batting tee, and fielding. At the conclusion of camp, the three Sounds players joined the children for a picnic lunch and signed autographs. The opportunity to take the field and receive instruction from professional baseball players was something valued by both the participants and the players. “I like pitching, I want to practice throwing the ball real far, too, and fast. I’ve met a lot of the players, they’re good teachers. They show us how to do everything and they tell us the rules so we understand. They’re always joking around with us and giving us a hard time,” said Marquis, while communicating through an interpreter using sign language. “As soon as we start mentioning baseball camp, they get excited. They can’t wait to come to the game and see the players that they worked with at camp,” said Lori Reed, an Eakin Elementary Teacher. The camp is also the continuation of a longstanding partnership between the team and the Sertoma Club. This article originally appeared on the official website of the Nashville Sounds. Click here to view the original story. Community outreach is nothing new to the Charleston RiverDogs as the leader of the Lowcountry’s professional sports team clearly sets the bar. But in return for the overwhelming support the region has provided the RiverDogs over the years, the team is happy to extend itself in return. At beautiful Joseph P. Riley, Jr. Park, that philanthropic spirit can be witnessed through our weekly “Dogs with a Cause Night,” where local nonprofit organizations promote their worthy causes to patrons at home games that fall on Mondays. Away from the friendly confines, the “Be Your Own Fan” mission shines through in the “Reading and Running with the RiverDogs” program for schoolchildren, as well as monthly community service projects staffed by RiverDogs employees during the offseason. This year, the RiverDogs are pleased to announce partnerships with Lowcountry Food Bank, Coastal Crisis Chaplaincy, Water Missions International and Teacher Supply Closet, which all position themselves to better help the Holy City and surrounding areas. In conjunction with local grocer Piggly Wiggly, RiverDogs fans have the opportunity to aid the needy and catch every ballgame with a special two-for-one rate by donating two canned food items to the Lowcountry Food Bank. With a grassroots network of more than 320 member agencies providing hunger-relief services throughout the 10 coastal counties of South Carolina, the Lowcountry Food Bank has been a pillar in the Charleston community since 1983. Our “Raising Cane Launch-A-Ball” promotion has long been a popular part of the gameday experience as fans purchase $1 tennis balls and takes aim at on-field targets after each game for the chance to win tickets and cash. This season, however, one has the ability to “have a ball” while supplying funds for the Coastal Crisis Chaplaincy in their quest to lend a helping hand to emergency agencies and personnel in the Charleston area during emergency situations. Half of the proceeds from the “Launch-A-Ball” postgame throw will be donated to the Coastal Crisis Chaplaincy, which has proven a comforting presence in trying times, including the 2007 Sofa Super Store tragic fire that claimed the lives of nine of Charleston’s firefighters. On the concourse this season, the Riley Park faithful may notice the Living Water Treatment System that Water Missions International has provided. A nonprofit Christian engineering organization, Water Missions International constructs these systems to allow for simple, durable water purification in developing countries and disaster areas. Located near the left field line adjacent to the customer relations desk, Water Missions International is able to support a community of 3,000-5,000 people with the treated water. The RiverDogs are pleased to provide the space and hope that loyal supporters will strive to find out how they can help provide clean water as “the source of life” and add to the more than two million people that have received relief and hope through Water Missions International’s work. Last but certainly not least is the club’s alliance with the Teacher Supply Closet, which serves the educational needs of children in the Tri-county area by providing a unique means to offer free merchandise for teachers to use in their classrooms. During all RiverDogs home games, fans are able to drop off items at the customer relations desk which go toward the Teacher Supply Closet’s goal to give every Lowcountry child the supplies they need to succeed in school. With nearly the entire home slate still on tap, there are many chances to catch exciting RiverDogs action and “Be Your Own Fan” while jumping on board to strengthen the fiber of the Charleston community … like the RiverDogs have. The Akron Aeros office staff took a break from the ballpark on Tuesday, April 19 to volunteer at Akron’s own local non-profit, Mobile Meals, as their monthly community service venture. The group met at the Kenmore Senior Community Center and split into five driving routes to distribute frozen, hot and special-diet meals to residence in the Kenmore area. Elaine Seyerle, Mobile Meals’ Director of Case Management, showed the staff how to decipher routes and read food orders, helping the group to deliver a portion of the 3,500 meals the organization provides daily to the elderly, disabled individuals and children. “I really enjoyed delivering the food. Everyone greeted us at the door with a smile. I could just see how grateful they were,” said TYLER McNUTT, Akron Aeros Sales Associate. After the routes were completed, the Aeros staff arrived at the Mobile Meals headquarters for an education session and a tour of the facility. “It’s amazing to see all of the work that goes on behind the scenes. They are truly a great asset to this community, and I really hope other people take notice and volunteer,” said MIKE LINK, Akron Aeros Group Sales Representative. Mobile Meals offers not only meal and supplement delivery, but also grocery shopping services, dining centers and nutrition education and counseling to North Eastern Ohio. For more information on volunteering and getting involved with Mobile Meals, visit their website at www.mobilemealsinc.org. Aeros' staff Brett Joyce, Nate Michel and Sierra Sawtelle organize driving routes for their meal deliveries. Aeros' staff Nicole Blum and Steve Baer help one another with loading meals into the vehicles. An employee-led food drive to support the “Strike Out Hunger” Campaign on Delmarva generated more than 9,350 pounds of non-perishable food items to benefit the Eastern Shore Branch of the Maryland Food Bank, the Food Bank of Delaware and the Eastern Shore Branch of the Food Bank of Southeastern Virginia. Building on a company commitment to fighting hunger in our communities, Perdue is sponsoring the 2011 “Strike Out Hunger” South Atlantic League All-Star Game at Arthur W. Perdue Stadium on behalf of the three Feeding America-affiliated food banks serving Delmarva. The associated “Strike Out Hunger” Campaign, which will run until the June 21 game, is focused on raising food donations and funds, and encouraging volunteer efforts all across Delmarva to benefit the three food banks. The two-week food drive engaged associates from Perdue facilities on Delmarva. Associates were able to donate enough food to the three food banks combined to provide more than 7,200 meals for families and individuals on Delmarva. On April 12, associate volunteers helped unload and sort 3,638 pounds of donated items to the Eastern Shore branch of the Maryland Food Bank in Salisbury. The Eastern Shore branch of the Food Bank of Southeastern Virginia received 1,218 pounds of food, all from the Perdue Accomac processing plant associates. In Delaware, associates, including those at the Georgetown and Milford plants, donated 4,539 pounds of food, which benefitted the Food Bank of Delaware. This article first appeared on the official website of the Delmarva Shorebirds. Click here to read the original story. We know that every child that steps onto a baseball or softball diamond dreams of putting on a big league uniform. While few will realize that goal, the youth of Charleston’s peninsula will now be able to come close. The Charleston RiverDogs have partnered with Gildan Distributors to lend free t-shirts to all Peninsula Parks and Recreation youth baseball and softball teams. Peninsula youngsters will also have the opportunity to “Be Your Own Fan” and save their parents some cash at every Sunday home game. Any child that comes to Joseph P. Riley, Jr. Park sporting their uniform will receive a free general admission ticket to our Family Sundays, which feature Free Parking and Kids Eat Free. Dressing like the Yankees of tomorrow is one thing but taking the field with them is another. On Sunday, May 22, Peninsula Parks and Recreation baseball and softball players will get to do both as the RiverDogs host the inaugural Peninsula Youth Sports Day. Prior to the RiverDogs game versus the Augusta GreenJackets (5:05 pm first pitch), all Little Leaguers will be invited onto the field to participate in a pregame parade in recognition of their dedication and hard work. The Delmarva Shorebirds, the class “A” affiliate of the Baltimore Orioles, are thrilled to announce that the club has collected 973 pounds of canned food items to benefit the “Strike Out Hunger” campaign associated with 2011 South Atlantic League All-Star Game presented by Perdue. Therefore, Sherman the Shorebird, who was banned last week from Perdue Stadium until the club accumulated at least 500 pounds, has been saved. Sherman will be able to attend Tuesday night’s exhibition game against Salisbury University and the rest of the games because of the generosity of the community. The “Strike Out Hunger” campaign was developed in conjunction with Perdue and the 2011 South Atlantic League All-Star Game, which will be contested on June 21 at Arthur W. Perdue Stadium. The campaign is focused on raising food donations and funds, and encouraging volunteer efforts to benefit the Eastern Shore Branch of the Maryland Food Bank, the Food Bank of Delaware and the Eastern Shore Branch of the Food Bank of Southeastern Virginia. The Shorebirds kicked off the canned food drive by collecting over 200 pounds of food at the 9th Annual Hot Stove Banquet at The Fountains Wedding & Conference Center. More recently, on March 26 at the annual Fan Fest event, fans contributed nearly 275 pounds of canned food items. The Shorebirds also raised $124 dollars for the initiative at Fan Fest. The Shorebirds also received a significant contribution from Ovations Food Services employees and members of the Delmarva Shorebirds Fan Club. Sherman the Shorebird will be in attendance on Tuesday, April 5 when the Shorebirds play an exhibition game against Salisbury University at 7:05 p.m. Fans are encouraged to bring canned food items to the game. Drop boxes will be located right inside the main entrance to the stadium.